Today my goal was to increase outdoor running mileage without hurting my recovery from the sore tendons around my hip. That meant another moderately paced workout on a softer surface than pavement. My choices were either to run the trails, or to go to the local high school and run on the track. I chose the track option because I wanted a surface that was harder than dirt, but softer than the road. When I arrived at the high school, I saw hundreds of parked cars and many more drivers looking to do the same. I almost turned around and drove home, but decided to try a remote lot near the track in case there were any spots. Luckily, I found a space and walked over to the track where I saw hundreds of lacrosse players and their coaches on the field. 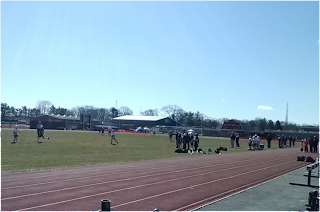 Adjacent to the main field, baseball games were being held, and lacrosse players from various towns were warming up everywhere. I saw a single runner and a couple of walkers on the track. I figured that if they were there, it would be okay for me to join them. I set off at a high nine-minute pace, hoping to avoid collisions with parents standing in the track lanes. A few players and lacrosse balls whizzed across the lanes as I went by, but there were no close calls. As I made my way around, I observed hundreds of players in the surrounding fields and noticed some concession stands that were branded with the NY Lizards logo. That explained the crowds. Apparently today was a Lacrosse-a-palooza, with games and (possibly) a clinic. Later, when I was leaving, I saw many cars parked across the road at Stillwell. After seeing that mess, I was glad I didn't opt for a trail run today. I ran well today. I split my direction halfway, first running counter-clockwise and then reversing after two miles. I suffered no hip pain, although I did begin to sense some tightness by the first mile. I kept my speed moderate except near the end, when I picked it up a step. I couldn't determine my true pace because the Garmin's tracking was way off. I knew this because the watch chirped for its first quarter mile a good thirty meters before I'd lapped it. After looking at the run map (above), I could see that it had also recorded me in places I didn't travel. I finished my four miles feeling like I could easily go another few. I decided to stop at that point, because I'd achieved my goal of progressive distance. I saw no reason to risk further aggravating my injury. Another run like this will work for me tomorrow, perhaps at Bethpage where I would encounter some hills. I'll give it a few more runs before I restart speed-oriented training. Right now, it feels great to run, both physically and psychologically.